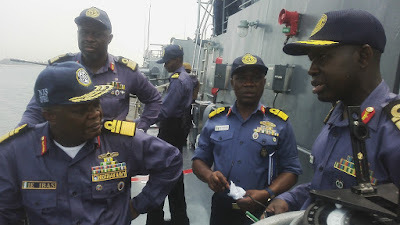 Also 46 vessels, barges and 31 big wooden boats were impounded within the period under review, said Chief of Training and Operations (CTOPS) Rear Admiral Mackson Kadiri. Kadiri spoke in Abuja at a briefing with reporters were the navy’s scorecard for 2018 was presented. He noted that various exercises being organised by the NN had led to the reduction in maritime crimes especially piracy, adding that there was no attack in June and Agust, while one was recorded each in July, October and December last year. He said: “The recorded cases of attacks on shipping have been mainly along the coasts of Bayelsa, Delta and Rivers States. The few cases of attacks on shipping are indicative of the efforts of the NN. “It is also gratifying to report that there has been significant reduction in the cases of attack on Oil and Gas Installations (OGI). The few attacks recorded took place in the swamp/onshore areas, with none reported against OGI located offshore during the year in focus. “As records indicate, from January to December 2018, a total of 34 pirates’ attacks on shipping were reported with nine successful and 25 unsuccessful. Furthermore, a total of 20 sea robbery attacks were reported in 2018 out of which six were successful and 14 unsuccessful. “Since the inception of Operation TSARE TEKU in April 2016, there has been drastic reduction in reported incidents of attack with even fewer successful attacks. Additionally, a total of 46 vessels and barges were arrested for involvement in maritime crimes during the period under review. According to Kadiri, the NN was in the process of rounding up the fifth phase of Exercise TSARE TEKU and would flag-off the sixth. Since most of the attacks at sea originate from land, Kadiri said the NN had since March 2016, emplaced a Choke Point Management and Control Regime which allows the deployment of armed personnel to strategic locations within creeks in houseboat. “So far, nine houseboats otherwise known as Naval Security Stations (NSS) have been deployed where crude oil theft and illegal refining activities are known to be prevalent. More locations have been identified for deployment of NSSs in this 2019. Highlighting other exercises carried out by the NN and their gains, Kadiri said Operation River Sweep conducted mostly in Delta and Rivers States destroyed 637 illegal refining sites, apprehended 104 speed boats and 340 suspects last year. “In summary, the quantity of crude oil lost as a result of illegal refining activities in 2018 is about 277,040 barrels, while about 23.1 Million litres of AGO, 212,610 litres of PMS and 1.2 Million litres of DPK were also lost,” said Kadiri. The achievements notwithstanding, Kadiri stated the need for more funding for the NN in view of various ship rehabilitation/repair programmes geared towards operational availability of capital ships to enable the service meet its statutory responsibilities. He said the NN would require more Offshore Patrol Vessels (OPVs), helicopters and predator drones as immediate intervention. “While noting the nexus between the successes and the availability of adequate resources, including international and regional collaboration, there is still need to address some outstanding issues and capability gaps affecting NN operations. “The need for NNPC to impress on oil companies to emplace more effective surveillance/monitoring mechanisms on their crude oil pipeline networks is also necessary. Going forward, the Nigerian Navy remains committed and resolute in ensuring safer waterways and sea lanes for Nigeria’s economy to thrive,” he said.